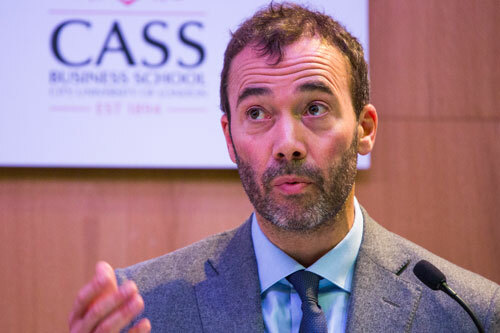 Mr Lewis, an alumnus of City, University of London’s prestigious School of Journalism, was at Cass to formally launch Lessons in Leadership - a certified series of online masterclasses produced by Dow Jones and Cass and the first online learning collaboration between a major media organisation and a leading business school. An edited version of his lecture is republished below. "It is an honour to be here this evening. "Marianne Lewis and I are very proud of our joint venture, Lessons in Leadership. Together, we have created a cutting edge product that shows the way forward for digital education experiences. We have all had enough of the old fashioned case study way of learning, and the merging of our exclusive content with Cass’s brilliant professors is truly refreshing. "I have spent more than 25 years listening to and learning from CEOs, and Lessons in Leadership encapsulates all of those lessons, and more. "So what does it take to be a successful CEO? "My teenage children often ask me that question, and my suspicion is that what they are really saying is: “If Dad can do it, surely anyone can.” The truth is that being a CEO is very much like being a parent. Without patience, you are not going to succeed, and are more likely to run yourself into the ground. "But as we will hear tonight, successful CEOs tend to focus on ensuring their organisations are instilled with a compelling sense of mission and direction, and that scarce resources are appropriately allocated to support that mission (and when I say scarce resources, I mean people). "Perhaps the most important role of being a good CEO is making sure you have the right people, with the most diverse backgrounds, in the most important jobs inside the company—all feeling motivated and working effectively as a team. "So, think of the CEO as part-parent, part-social worker. If you can get all that right as a CEO, while safeguarding the heritage, value and soul of the company you are leading, you are well on your way. "But don’t forget the need to constantly adapt and innovate. I think it is fair to say that it is really challenging out there; more so, in my mind, than for many years, given the speed of change and the almost daily pressure to adapt and correct course. Business leaders are in effect having to redesign their planes mid-flight, and that often causes understandable turbulence. "And if your own career path is anything like mine, it will be anything but a straight line. Believe it or not, that is a good thing. "In one of the interviews we did for Lessons in Leadership, Anthony Pratt, the CEO of global paper and packaging giant Pratt Industries, said: "Life's not a journey. It's more of a washing machine." "When we first began exploring the idea of Lessons in Leadership, for good or bad, Britain had just voted to bid farewell to the European Union and the U.S. was about to install its first CEO president. Perhaps counter intuitively, economies in both developed and emerging markets were starting to show renewed signs of vigour, and global stock markets were about to test all time highs. But corporate culture and the cult of the CEO remained, and remains, under the microscope. "Here in Britain, the sudden and rather spectacular failure of construction group Carillion has left many uncomfortable questions unanswered, not to mention the downfall of once ubiquitous high street retailers BHS, Maplin and Toys ‘R Us. "One only needs to read The Wall Street Journal, and its in-depth coverage of the rise and fall of the iconic General Electric, to know that once a company starts flying a spare business jet behind the one carrying the CEO, adult supervision is lacking. "Is another financial and economic crisis lurking around the corner? Recent sabre rattling over global trade certainly won’t help matters. If there were any lasting lessons from the global financial meltdown and Great Recession, it is that corporate disaster is the certain byproduct of a corrosive culture in which the CEO is treated like a rock star. "While the average CEO has a shelf life of less than five years today, the business leaders I had the pleasure of speaking with as part of Lessons in Leadership have all demonstrated an amazing ability to remain at the top of their game over many years, in industries as diverse as financial services, tech, pharma and advertising. Collectively, they employ over a million people in more than 200 countries around the world, with hundreds of millions of customers. "It may therefore come as a surprise that the lesson all these extremely powerful men and women stressed was the need to be humble. “Always carry your own bags,” as Coca-Cola Chairman and former CEO Muhtar Kent, a graduate of the Cass Business School, told me. "Most kept coming back to the same notion that, as global business leaders, they were simply custodians of powerful brands—some, like Dow Jones, more than a century old—and that if you don’t have the public trust, you have nothing. "This is something my industry, the media industry, has had to learn the hard way in recent years, and is still very much struggling with today. But having a vision, a purpose and the trust of the community in which you operate is essential. "Where that goal, or vision, sometimes comes from may surprise you. Tech Mahindra CEO, CP Gurnani, offered that many of the Indian group's successes are tied to an advisory board of young Millennial and post-Millennial employees. “I take my supervisory board seriously, but I take my shadow board even more seriously where the average age is 28,” he said. "CP was not alone. Many CEOs that I speak to regularly agree that Millennial and post-Millennial employees have a tremendous leadership role to play in companies that are serious about innovation and novel ways of addressing new markets. After all, you are the digital natives; we are simply digital immigrants, in a confusing world where every company is desperate to become the next tech wonder. "When the consumer is wrestling with your authenticity, it helps to have a workforce that is as diverse as the community it serves. "So work out who you are, what you stand for, and be that person all the time. I can tell you from personal experience that the more diverse a culture, the better the ideas and the increased likelihood of success. "I can’t think of a better note on which to end this talk. Thank you."